*Prices are indicative and depend on the current silver price and exchange rates and on your ring sizes. Shipping costs and possible tax rates excluded. Please see Order guide for information on costs of delivery. 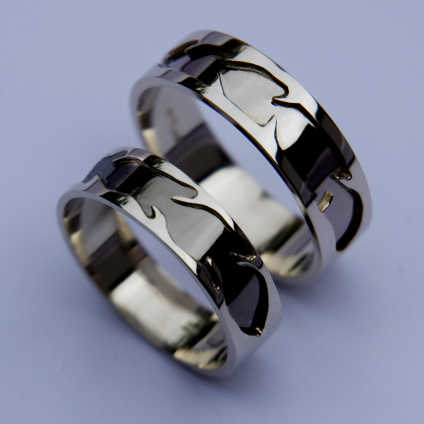 Design and title of these sterling silver overlay wedding rings refer to an age-old concept based on Anishinaabe culture that, depending on the context, holds multiple layers of meaning. Izhinamowin, or ishinaamowin, can mean mental or spiritual perception, dream, or vision, or world view. Its literal meaning is “the act of seeing the world in a certain manner”. If you like to read more about this subject go to our art blog.